If it happened then, why not now? In 1976 William Kurelek (1927-1977) created a unique book entitled, A Northern Nativity, celebrating the Birth of the Christ Child for all people, based on a series of his paintings using the multicultural tapestry of Canada, the adopted land of his Ukrainian immigrant family. The book is set in the time of the Great Depression of the 1930’s. William, a boy of twelve years or so, begins a sequence of dreams in mid-winter, night after night as he climbs up to his cold bedroom from the warmth of a farmhouse kitchen. These dreams take William from his first shivering dream of the Nativity in the Artic in an Inuit igloo to a succession of dreams of the Birth of Christ in places all across Canada, reflecting the gritty, ethnic distinctive of each region. The dream in the painting above is entitled Across the River from the Capital. Immediately our eye is drawn to the lower left, where we see a kerosene lamp casting light across a snowy ground onto a curious little group. 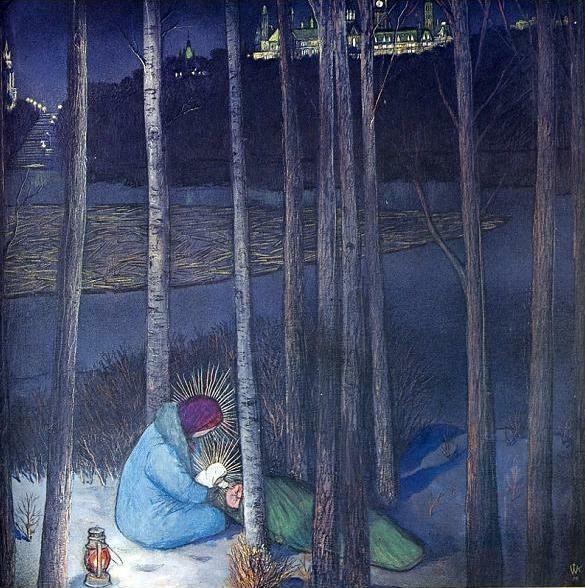 A bundled up woman with a child in her arms sits on the cold earth before a figure stretched out, mummy-like, in a green army sleeping bag amidst a stand of barren birch trees in the dead of winter. The child’s hand gently reaches from his mother’s arms to touch the forehead of the sleeper, who happens in William’s dream to be himself, years hence, as he imagines himself as grownup Bill – adventurous, independent and free from dependence on anyone. Next our eye is drawn to the many small lights in an extensive building across the river that stands at the top of the picture. It is recognizable as the Canadian Parliament Hill in Ottawa. The lights indicate that the delegates are deliberating within. Yet these lights are a mere twinkle by comparison to the bright light coming forth from the humble, huddling figures on the other side of the river below. Kurelek subtly shows the tensions of Canadian cultural life as the river he depicts is the main dividing line between the province of dominantly French speaking Quebec and the dominantly English speaking province of Ontario. For his scene Kurelek picks the point in the river that separates the cities of Ottawa with all its entitlements as the Capital City and Hull, working class and marginalized. (Today Hull is integrated into National Capital Region. In Kurelek’s day it was considered insignificant.) Clearly our three-some are on the ‘wrong side of the tracks’ and to be identified with the weak and socially disenfranchised. Yes, indeed! Amidst a world fanatically driven to violence by inordinate ethnic pride, economic greed and maniacal craving for power, what would it mean if our legislators and we as individuals would welcome Him as the Sun of Righteousness and the Prince of Peace? William Kurelek: Across the River from the Capital, 1976, mixed media on board, 50 cm x 50 cm (these are the details of the painting). The book: William Kurelek, A Northern Nativity, Tundra Books, 1976. William Kurelek (1927-1977) was born on a farm near Whitford, 75 miles northeast of Edmonton, Alberta, Canada. The family moved to Stonewall, Manitoba, near Winnipeg, where Kurelek went through school. He graduated in 1946. It was shortly after this that his first symptoms of mental illness began to appear. After receiving a Bachelor of Arts degree from the University of Manitoba, Kurelek entered the Ontario College of Art, but withdrew after the first term. He spent his summers working in bush lumber camps near Ontario and then travelled to Mexico, enrolling in the San Miguel Art School, where he stayed for two years. In June of 1952 he travelled to London England, and it was in London that he began to seek medical treatment for his disorder. For the next year and a half he became a resident, and shortly thereafter an out-patient, of Maudley Psychiatric Hospital. During this time he travelled throughout Europe. After Leaving Maudley in late 1953 and entering Netherne, another institution, Kurelek converted to Catholicism and began painting biblical scenes and subjects. Kurelek left Netherne in 1955 and travelled to Turkey, Greece and Israel before returning to Canada in 1959. After his return he began to create the 160 piece Passion of Christ series, bringing him critical acclaim and recognition after its completion in 1963. Kurelek spent the rest of his life painting, writing and illustrating books until he died in 1977. The catalogue of the Messenger exhibition, the largest exhibition ever held of Kurelek’s work, which toured across Canada in 2011 and 2012: Tobi Bruce, Mary Jo Hughes and Andrew Kear, William Kurelek: The Messenger, Art Gallery of Greater Victoria, bilingual edition, 2012.